Foxhill Lady Gaga from the Alford family, Cullompton took the supreme beef championship at Exeter’s Agrifest. Foxhill Lady Gaga from the Alford family, Cullompton. The supreme beef championship and the Royal Smithfield Royal Cornwall Trophy at the first Agrifest South West held at Westpoint, Exeter went to Michael, Melanie and Charolotte Alford, Cullompton with Foxhill Lady Gaga. The British Blue-sired heifer bred by Trefor Jones is out of the Alfords former show cow, Lady Gaga. After a successful summer season, it was recently supreme at Countryside Live. Claiming the reserve title was Graham Ward, Torrington with Morse, a June 2016-born Limousin sired steer which was bought at the Sedgemoor calf sale from Messrs Lewis, Carmarthen and was being shown for the first time. Lin Calcraft, Honiton took the Bred and Fed championship with Miss Independent, an 18-month-old heifer by Swarland Eddie. Reserve champion was L.R.L. Morgan, Llysnewydd with January 2016-born, Princess. 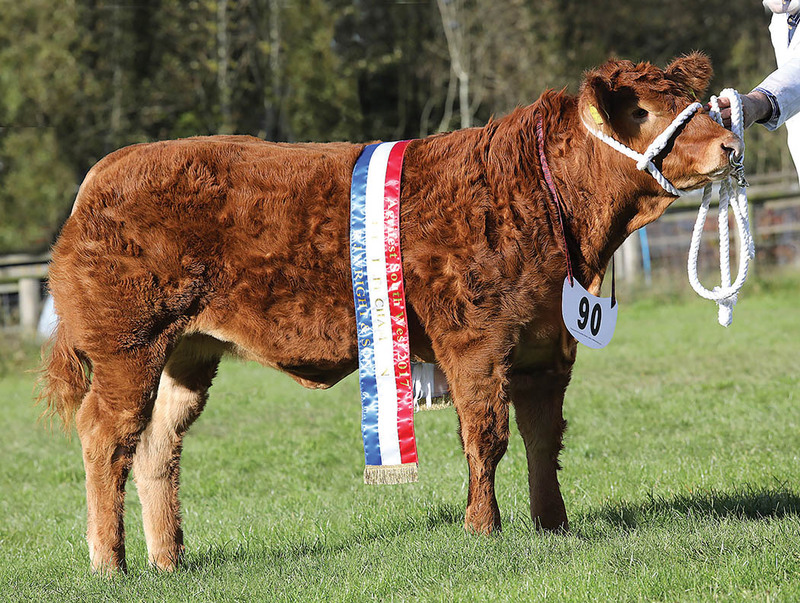 The baby beef championship also went to the Alfords with the May 2017-born pedigree Limousin heifer, Foxhillfarm Naomi by Ampertaine Gigolo out of Foxhillfarm Gracie which had been champion at the Sedgemoor calf show the previous week. Sarah-Jane Layton, Leominster took the reserve spot with her second placed Limousin-sired heifer, 10-month-old Lady De Beaut which had been reserve champion baby at Beef Expo and second at the Royal Welsh earlier in the year. Ms Layton also won the baby beef steer class with the 10-month-old British Blue cross, Braveheart. The long trip from Bentham near Lancaster paid off for Robert Garth when he took the supreme sheep championship with a pair of Beltex cross gimmers. By a Deanbrow ram, they weighed 41kg apiece. The reserve rosette went to the pair which were second in the class to the champions, a pair of 49kg pedigree Beltex wethers by Bishops Arnold from Andrew Bishop, Gloucester. The judge, Rob Rattray, a butcher from Aberystwyth said his champions handled the best with deep gigots and were well fleshed but there were other pairs not far behind. The pedigree calf championship went to the continental champion, Dymond Blue Magnum, a January 2107-born British Blue bull by Drift Domino out of Dymond Blue Iris from Nigel Jenkinson, Beaworthy. Foxhillfarm Nigella, a six-month-old Limousin heifer by Neuf out Glenrock Illusion took the reserve continental and reserve overall titles for the Alfords. Champion and reserve native calves were Warrenho Erica T668, a nine-month-old Hallington Edition M362 daughter and Warrenho Empire T655, January 2017-born bull by Warrenho Dalmigavie G236 both from A.E. and C.R. Bishop, Wokingham. 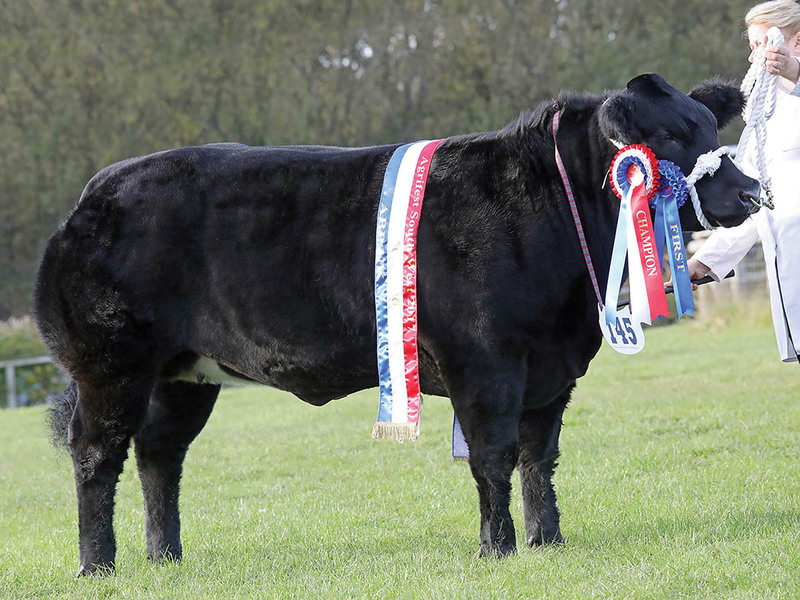 The Ruby Red Devon bull, Bollowal Front Row claimed the Young Bull of the Year and championship. Homebred by Jeff Thomas, Penzance, the January 2016-born son of Bollowal Barrister out of Bollowal Cherry 13 has already been awarded the breed society’s young bull of the year, judged on a points basis, this season. Reserve went to James Neale, Launceston with his June 2016-born Limousin bull, Nealford Monarch. By Ampertaine Inferno, it was reserve male champion at Royal Cornwall and inter-breed champion at Okehampton and Holsworthy shows earlier in the year. Baby beef champion Foxhillfarm Naomi, from the Alford family. 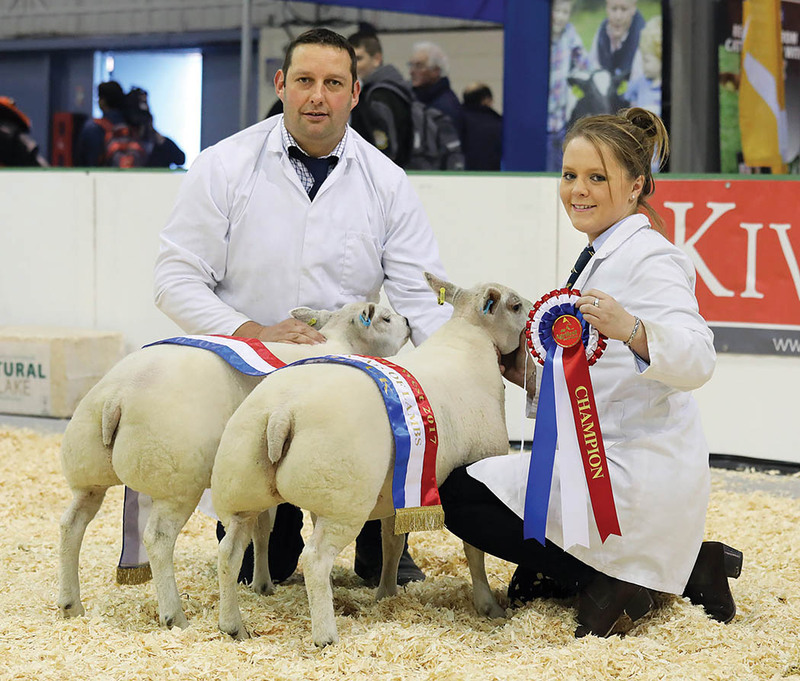 Supreme sheep champions from Robert Garth, Bentham. Commercial cattle (F. Page, Northamptonshire) Supreme, M. and M. Alford, Foxhill Lady Gaga; reserve, G.J. Ward, Morse. Bred and Fed - Sup., L. Calcraft, Miss Independent; res., L.R.L. Morgan, Princess. Baby beef - Sup., M. and M. Alford, Foxhillfarm Naomi; res., S.J. Layton, Lady De Beaut. Pedigree calves (J. McMillan, Hertfordshire) Sup. and continental, N. Jenkinson, Dymond Blue Magnum (British Blue); res. and res. continental, M. and M. Alford, Foxhillfarm Nigella (Limousin); native, A.E. and C.R. Bishop, Warrenho Erica T668 (Aberdeen-Angus); res., A.E. and C.R. Bishop, Warrenho Empire T655 (Aberdeen-Angus). Young bull of the year (J. McMillan) Sup., A.J. Thomas, Bollowal Front Row (Ruby Red Devon); res., J.H. Neale and Sons, Nealford Monarch (Limousin). Sheep (R. Rattray, Aberystwyth) Sup. R. Garth (Beltex cross); res., A.D. Bishop (Beltex).